Traction Drive Unit (reduction gear for high-accuracy feed)Application example> Printers, medical devices, FPD manufacturing equipment, robots, machine tools, etc. We need to do something about uneven rotational speed of the feed drum as this is the cause. Rotation is a given in machines, however depending on the product, precise, even rotation at an accurate slow pace is important. This case study looks at one such product - commercial printers used by a printing machinery manufacturer. This manufacturer was faced with the dilemma of frequency unevenness in feed drum rotation, no matter how carefully it manufactured printing machinery. In the field of graphic visual printing, aesthetics is everything, and printing misalignment due to uneven rotation can be described as a problem directly impacting creditability. A certain professor emeritus heard about the problem this manufacturer was facing and proposed using a traction drive in the reduction gear of the feed drum drive rather than a planetary gear, which has large speed variation. This professor mentioned JTEKT as a company knowledgeable in rotation. A traction drive is a device that transmits power through the rolling contact of multiple rollers. Compared to the contemporary gear-type reduction gear, traction drive is capable of smooth, stable speed reduction. 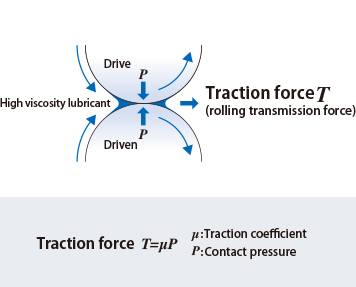 JTEKT's Traction Drive Unit applies the bearing technology accumulated by the Koyo brand. 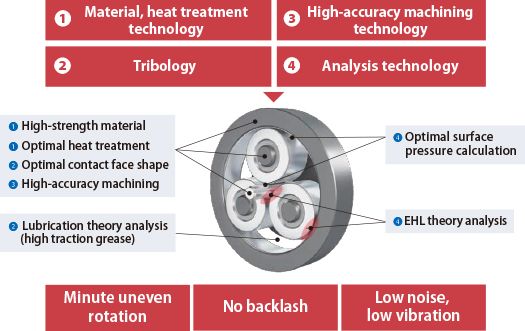 By leveraging high-accuracy machining at micron level, optimizing traction grease (lubricant) that sways friction between rollers, etc. it was possible to achieve highly accurate feed with a high transmission force. The Traction Drive Unit features bearing technology accumulated by the KOYO brand over many long years. The Traction Drive Unit is often subjected to inspections testing whether or not it can withstand usage. Due to the fact it is a device used for products demanding precision, an extremely high level of quality is expected. However, the values sought from inspections and the testers used vary widely depending on the customer. At JTEKT, we take the approach of working with customers on each step, including inspection method, so that the effectiveness of our product is understood. Minute uneven rotation! Contributing to the development of high performance printing machines. The manufacturer ultimately adopted our Traction Drive Unit in the printing machines it manufacturers and the effects were instant. The uneven rotation of the feed drum decreased significantly and printing quality improved dramatically. We were happy to receive positive feedback from customers such as "It was a huge help that the rotation became smooth." and "JTEKT's traction drive is highly accurate." We have also contributed to the creation of a high performance printing machine one rank higher than conventional models by adopting the Traction Drive Unit. JTEKT's ties with manufacturers are broadening out to unforeseen areas. Industrial Machinery Application Engineering Dept. I'd like companies troubled by uneven rotation, vibration and noise to know more about us. 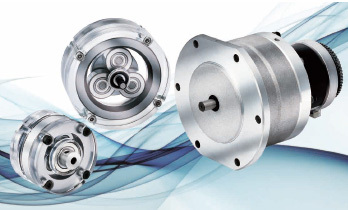 JTEKT's Traction Drive Unit was adopted for the first time on a machining center spindle in 1988. In 1993, it was mass produced in reduction gears for electric vehicles, and afterwards, began broadening out into a wide range of fields, including power steering and diagnostic imaging analysis equipment for medical X-rays. But I think there are still many companies in need of help. It would be sufficient to use a low-cost planetary gear or other type of reduction technology if the goal was simply to reduce power. But for manufacturers who require more intricate movement, I highly recommend they learn about the benefits of using our Traction Drive Unit. I hope that many people see this page and it serves as an opportunity to find the solution to their particular concern. JTEKT's Traction Drive Unit adopts a planetary roller structure as it is simple and highly reliable. 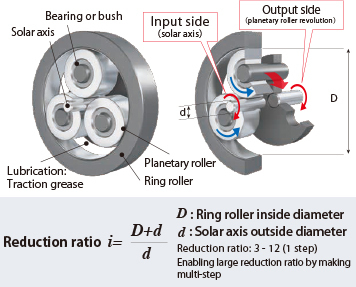 This reduction method converts input from the solar shaft to revolution output from the planetary rollers. We can customize this product to suit our customers requests, such as a type specifically for no backlash, a more compact design, etc.